I just watched a news story from Australia in which a Lebanese Australian called the confiscation of his mother-in-law’s zaatar by Sydney airport customs officials “a tragedy” and “a disaster” and when he still couldn’t convince the officials to release the vacuum packed zaatar, he told them he wanted to speak to a member of parliament. There, but for the grace of more merciful US customs officials, go I—and almost every other Arab American I know. Who amongst us hasn’t had a mother or aunt get out a bag of the stuff for our suitcases every time we journey off to foreign lands? 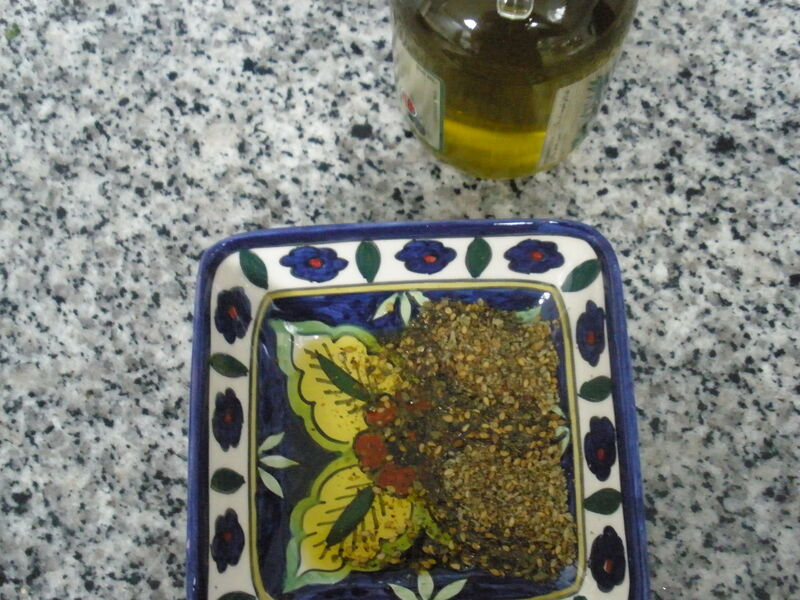 Zaatar, for those of you unfortunate enough to have never had it, is a mixture of wild thyme and sesame seeds that, mixed with olive oil, is an essential part of breakfast and even supper in Lebanon, Palestine, Syria, and Jordan, and beyond. It is tied with chocolate in my refrigerator as the number one comfort food. It might not sound like much of concoction, but it has hundreds of variations, with different thymes and different levels of roasting or not roasting changing the flavors, not to mention the unique mix of herbs added to zaatar that vary from village to village. And there’s nothing that brings back the Levant as unlocking that aroma in the bag your relative tucked into your suitcase. Zaatar is the most democratic of Middle Eastern foods, loved by all classes and ages, as I always witness in Jordan at IZHIMAN, a shop that offers several varieties of zaatar, all displayed in big wooden bins from which customers diligently sample before picking the varieties they’ll take home to make their own mixture at home. Fusion cuisine has hit the Middle East hard, like everywhere, and now you’ll find zaatar being a seasoning for almonds (kind of like Arabic Chex Mix), roasted chicken, croissants, and countless other ideas, some more unfortunate than others, although you can never go all that wrong with zaatar. And like the hookah, it’s got a retro chic cache to it these days, even being the name of a Middle Eastern restaurant chain that aims to give cutting edge appeal to old standbys. But perhaps the best way to eat zaatar is as manaeesh at the local bakery, where it is mixed with olive oil and baked on flat bread in a wood burning oven. So integral was manaeesh to our childhood that one when my brother and I were in college in Minneapolis watching the news about Beirut, there was a shot of our baker on Jeanne D’Arc Street busy sliding the manaeesh into the oven. “Abu Ibrahim,” we shouted out simultaneously, knowing that Beirut was still somewhat okay despite the news if Abu Ibrahim was still making manaeesh. There are a million zaatar stories, but I will end with this one—there was a war injured boy from the Middle East in Los Angeles for treatment that was staying with me for a few days. This was such a great kid and had just gotten out the hospital, and so we laid before him—not just me, but everyone else that took part in his care– all the wonders and decadence of food in Los Angeles for him everyday, but one day at breakfast he looked at it all, trying with all his politeness to muster enthusiasm, and then gave up and turned to me and said, “Don’t you have any zaatar? Please.” And of course, I did. thought of at the Louvre this Tuesday, that being the day of the week the Louvre is closed to the public. 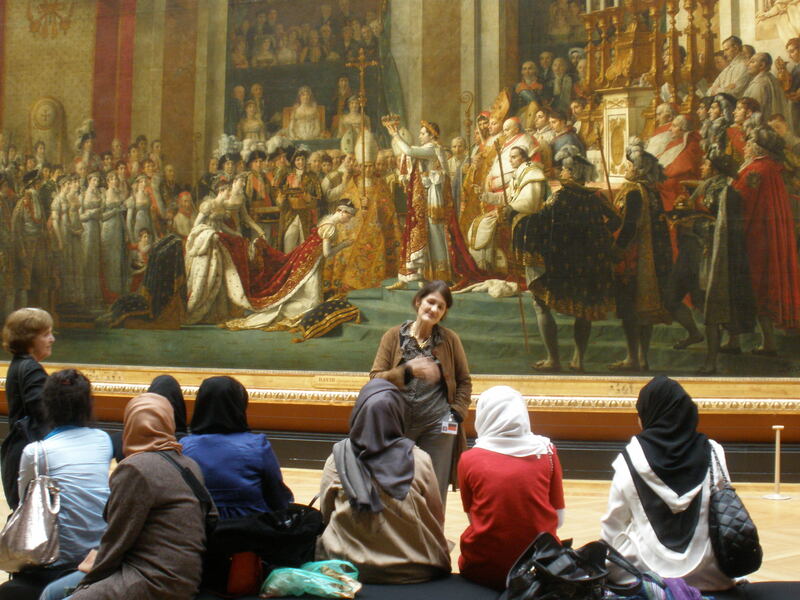 But it wasn’t closed to our students, and so there we were,–12 university students from Abu Dhabi, three professors, one curator, and two employees of France’s museum consortium, who were both as equally stunned as everyone but the students to have the opportunity to be in an empty Louvre. That’s when I first thought about the Da Vinci Code and those opening chapters in the Louvre, especially when we took by total surprise a woman on a ladder giving the Venus de Milo’s face a little touch up, as so many women need a little help at that age. The restoration artist got so flustered I was worried she’d fall off the ladder, and security was brought out to scurry us along so that she and Venus de Milo could have their privacy. Then of course you think about the book again when you come to Da Vinci’s paintings, which are usually so mobbed with tourists that just catching a glimpse is a wonder, especially when it comes to the Mona Lisa. But there she was hanging all by herself in the gallery, such a rare experience that even the two French museum consortium employees asked to have their picture taken with her. Just them and her. The students were more interested in taking pictures of themselves. And that is when I also started thinking about other codes, as in codes of behavior. I wondered about two things: would the students ever really grasp the level of welcome Paris has given them and what were the French people that were hosting them really thinking about them, especially when it came to topics like the Louvre Abu Dhabi, now being designed by legendary French architect Jean Nouvel? Actually, I could guess what everyone was thinking, so I think I was more interested in what people were thinking other people were thinking. That is a tougher code to break. Not that I’ve had that much time to think in Paris, kind of like you don’t think much when you read the Da Vinci Code. I’m here helping out my colleague Nancy Beth Jackson, who is here with her “Communicating Culture” class, which received a grant to introduce Emirati students to Paris. Just a sampling of what they’ve gotten to do—Sacre Couer during Easter mass, dessert as a reporter’s apartment in Montmartre, an invitation from a Normandy senator to visit the Senat, a meeting with one of the architects of the Louvre Abu Dhabi at Jean Nouvel’s studio, a talk with the curators of the Louvre Abu Dhabi, a tour and talk with one of the directors of the Cinematechque, a tour and talk with the editor in chief of Agence France-Press and the director of the AFP Foundation, a meeting with the director general and the diplomatic counselor of the Institut du Monde Arabe, a meeting in the VIP room at Hermes with the CEO, and a quick look at the Sorbonne despite a day with particularly high security due to a minister’s meeting (no, they weren’t invited to that). Indeed, it helps to be from Abu Dhabi in Paris, but there are decidedly mixed feelings in Paris about the Louvre and other French establishments coming to Abu Dhabi, perhaps best summed up in a clothing boutique we passed near the Sorbonne called “Bazar Abou Dhabi,” which my students looked at with pride, while the French students seem to look at it as a code for sarcasm. Indeed, as my students are well aware, part of hospitality they’ve received is about money, but another part of it is about Paris’ well-deserved pride in itself as a cultural center. So perhaps that’s why the curator at the Pompidou was a little disappointed on Monday when, despite all the fascinating stories he told them about the history of some of the works of art, the one time he had their full and rapt attention was when he said, “Now I’m going to show you the most expensive painting in the world.” (In case you’re wondering, it’s a Lucien Freud painting that was sold to a Russian collector for $430 million, to which someone said, “But it’s just an ugly, fat naked lady.”). While they might not be getting the codes for good art, they are figuring out other codes. “Khadija, Fatima, Aisha,” the man selling Eiffel Tower key chains in a Paris park called out after the students here, almost running with his bundle to catch up with them. Those aren’t, for the most part, their names, but he knew he had spotted some Gulf Arabs and was attempting to make a connection by calling out as many female names from the Koran as he could, as code for “I’m Muslim just like you.” Of course he’s not just like them, and they know it and he knows it. What they know is that everyone from every income level and status level has an interest in them, because they are from Abu Dhabi and because they are women from Abu Dhabi. And sitting a Paris café watching them decipher their odd celebrity is more complex entertainment than the Da Vinci Code.